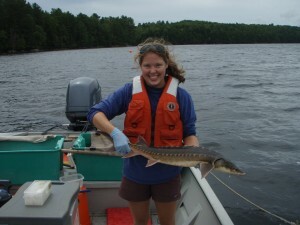 Catherine Johnston holding a shortnose sturgeon. ESA Permit Number 16306. The removal of dams on Maine rivers offers the potential to restore fish habitat and significantly affect populations of endangered species such as shortnose sturgeon (Acipenser brevirostrum). Two dams were removed on the Penobscot River in Maine in 2012 and 2013, opening up 14 kilometers of river and restoring 100% of the historic range of shortnose sturgeon in the river. Research is underway to consider how shortnose sturgeon respond to the dam removals, with a particular focus on whether they use the newly available stretches of river for spawning. Both increased access to habitat along with habitat quality are considered to better understand the potential for sturgeon populations to respond to the restoration activities. Shortnose sturgeon spawn in fresh water but migrate to salt water for growth and feeding. Spawning activities in other river systems occur within a narrow range of water velocities, from 0.4 to 1.8 m/s, at depths ranging from 1.2 to 10.4 m, when water temperature ranges between 9 and 15°C. Cobble, gravel, boulder, and ledge have been classified as suitable substrates for spawning. Spawning occurs in the spring, after which shortnose sturgeon move downriver to the estuary to forage for the summer. When water temperatures cool in the fall, sturgeon move back up and aggregate at freshwater overwintering areas. In the spring when temperatures begin to warm they move farther upstream to spawning grounds. Through acoustic telemetry, shortnose sturgeon have been documented foraging and wintering in the Penobscot River, but no indication of spawning has been seen since monitoring began in 2007. Monitoring for signs of spawning in the Penobscot River occurs each spring during the expected spawning season via acoustic telemetry and early life stage sampling. D-shaped ichthyoplankton nets are used to sample for larval shortnose sturgeon and egg mats are deployed on the river bottom to collect eggs. Since 2007, all acoustically tagged shortnose sturgeon have moved downstream after overwintering in the Penobscot River rather than upstream, counter to expectations if spawning occurred in the river. No larval shortnose sturgeon or sturgeon eggs have been collected to date. Acoustic telemetry has revealed that many individuals make movements through the Gulf of Maine to the Kennebec River, where they have been detected on spawning grounds during the spawning season. With the removal of the dams on the Penobscot River, there is increased availability of habitat for use by shortnose sturgeon, including for spawning. However, shortnose sturgeon have been reported to spawn under certain suitable habitat conditions so an objective of this study is to examine suitability of the newly available habitat. In concert with the efforts to document sturgeon behavior in the post-dam removal system, the distribution and abundance of suitable spawning habitat in the Penobscot River above the dam sites has been and continues to be assessed. Using a two- dimensional hydrodynamic model called River 2D, suitable habitat for spawning has been identified in the upper Penobscot River both above and below the removed dam sites. Suitable spawning habitat was predicted to be present within the river at all discharges modeled and was primarily distributed along the margins of the river, especially at higher discharges. However, this model did not incorporate a crucial physical characteristic of spawning habitat, substrate type. Bottoms composed of substrate with large interstitial spaces, like cobble and boulders, have been described as key for spawning habitat by providing protection from currents, surface area for egg adhesion, and protection from predators. The next step in determining spawning habitat suitability in the newly available reaches of the Penobscot River is to incorporate physical characteristics of the river bottom into the River 2D model. Spawning habitat suitability will be calculated for a range of spring discharge levels and will be analyzed to determine percent weighted usable area. The resulting habitat suitability maps can be used to identify locations for more detailed spawning sampling and can aid any future restoration efforts. Preliminary runs of the updated model predict that in the river reach upstream of the lower dam site (Veazie Dam), over 50% of the modeled area is suitable at a discharge of 1,308 cms. In addition, field collection of bottom substrate data indicates that the dominant substrate types within this reach are cobble and gravel, which are suitable for spawning. Considerations of habitat suitability are important as research continues to assess how the endangered shortnose sturgeon uses the Penobscot River after dam removals. If spawning commenced in the Penobscot River, this would have great implications for the health of the broader Gulf of Maine population of shortnose sturgeon and would represent a large step towards restoration of the species.